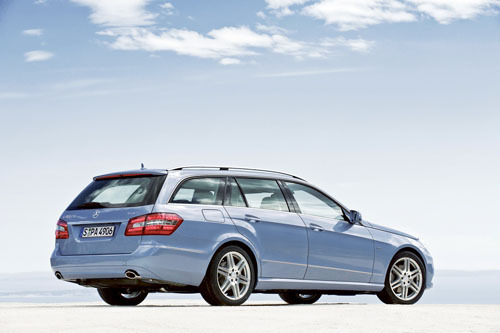 From early 2010, Mercedes-Benz is launching the estate version as another highly distinctive member of the E-Class family. Like the E-Class Saloon and Coupé, the Estate combines its own, elegant design with leadership in safety, comfort, quality and practicality. A number of technical innovations have entered series production in the E-Class which no other car in this class is able to offer - from drowsiness detection to automatic emergency braking when an accident is recognised as imminent, and from Adaptive Highbeam Assist to the active bonnet. The Estate also features all these innovations. Air suspension with self-levelling at the rear is expected to be be standard as is unique new load compartment management features, including an 'Easy-Pack' automatic powered tailgate and 'Easy-Pack' Quick Fold rear seats. The E-Class Estate is seen as the founder of the premium lifestyle estate segment with a history spanning over ore than 30 years. Since the launch of the first Estate in 1977, more than one million customers have discovered their enthusiasm for this practical way of driving a luxury Mercedes-Benz. This success story is set to be continued by the fifth generation of the E-Class Estate – at the same time following up on the successful launch of the Saloon. Launched in Europe in spring 2009, the E-Class Saloon had already achieved worldwide market leadership in its segment by May 2009. The performance of the Saloon and Coupé in the 2009 AutoBild Design Awards shows how well the striking lines of the E-Class have been received: more than 100,000 readers of this German motoring publication recently voted the four-door model the most beautiful car in the world, and gave the two-door model first place in the Coupé/Convertible category.